One of the things that appeals to me about webcomics, is that it’s given a rise to a great number of autobiographical comic artists. These comic artists tend to be primarily young writers and artists, and webcomics allow them a chance to share the highlight of their day or those split-second funny moments with the rest of the world. It also has other benefits, such as allowing the writer/artist to perfect deadlines, improve their storytelling and artwork…but I digress. 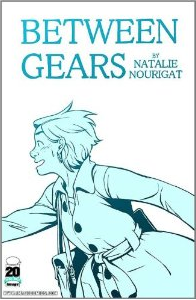 This increase I think has helped develop and nurture young writers/artists and introduce them to the world (and allow them to get published), such as Natalie Nourigat, the creator of this work. Natalie shares with readers a day by day account of her senior year in college–her adventures in finishing homework, of sorority life, of finding those quiet moments in hectic time, of wondering what life will be like after college. It’s these types of moments that are easy for anyone to relate to. While a number of the comics share the seemingly trivial aspects of the day, Natalie allows us to take a close look at who she is, what drives her and makes her who she is, and at times giving us deeply personal glimpses into her life as a young woman just about to enter the real world. And to me that’s the best thing about this work. She doesn’t try to hide those moments that others might be embarrassed about or hide the genuine love that she feels for her family and friends. It’s like she’s got a video camera with her and we get to follow her along everywhere that she goes. And yes there are days where it feels like nothing has happened or that the moment she shared with us is less than interesting, but that’s what makes this such a great work. She bares her life to us. It inspires me to create an autobiographical webcomic…not that my day would be interesting as Natalie’s but…still. Natalie’s artwork is deceptively simple, easily capturing the bare essence of the characters in a few simple lines and bringing to life the world around her. And the great thing about her doing a daily comic is that we get to see her art and style progress as she learns more about her craft and how to quickly capture those moments without spending days upon days trying to catch every detail. When she first starts the comic the artwork definitely has a more anime style to it in how the characters are drawn and move, and she uses thicker brush strokes to capture everything. But by the end of the book she’s progressed to a slightly more realistic style and thinner brush strokes. Don’t get me wrong, I like the artwork all throughout the book, but seeing the progression gives a great indication of the time and effort Natalie put into honing her craft (and an example that others can follow.) Overall the images are engaging and draw you in so that you can be a part of her life. This is definitely a book that I’m purchasing for my shelves and I would recommend it to any fan of autobiographical comics. And while you can read all of the entries online (http://betweengears.smackjeeves.com/), do yourself a favor and buy the book so that you can see the details even better.